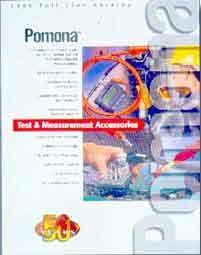 Pomona Electronicsll line catalog features DMM accessories, a family of high performance oscilloscope probes, and an IEC1010 compliant minigrabber. The redesigned DMM accessories are featured in the company's Test Companion Kits which are compatible with Fluke, Hewlett-Packard, Tektronix or Wavetek DMMs and oscilloscopes. Together, they enable faster, more accurate and more reliable testing for a range of applications. Also featured in the catalog are X1/X10 Passive Oscilloscope Probes offering dual-bandwidth performance for greater test flexibility, a 7/16 DIN Adapter Kit improving intermodulation performance, and a Push-On BNC 50 Ohm Cable allowing secure retention with the convenience of a push-on connector.